Devonshire Mall has announced the first group of retailers opening in the new food court on June 27th, 2018. They are Cultures, Kentucky Fried Chicken, Taco Bell, Tim Hortons, Mucho Burrito, Feta & Olives, Hurry Curry, A & W, Niko Sushi, and Freshly Squeezed. Mandarin Restaurant and a relocated, innovative Shoppers Drug Mart will join the grand opening festivities along with Mountain Warehouse, Bikini Village and a relocated and redesigned Footlocker. The new food court will house 15 retailers, an expanded seating area, a new entranceway, new washroom facilities and an organic food recycling program, all within a bright and welcoming new space. “We are very proud and pleased to make this announcement today and look forward to sharing more information on new retailers joining the tenant mix at Devonshire Mall. 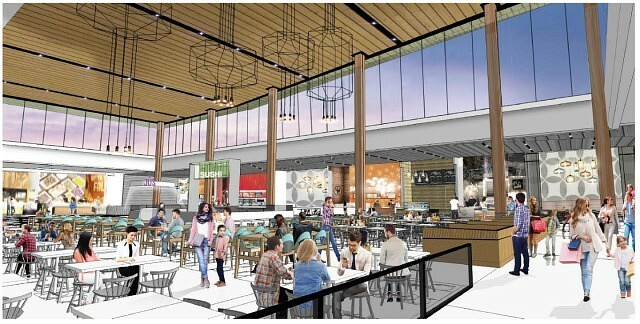 Construction in the remaining food court units will be ongoing throughout the summer along with ceiling and floor treatments throughout the centre.” said Chris Savard, General Manager.